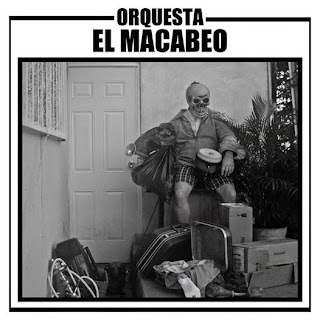 In what I'm positive will be holding the title of the single with the most record labels behind it of all time is this latest from Orquesta El Macabeo, a Puerto Rican twelve piece Salsa band. Ive been following DJ Andujar and his Peace & Rhythm blog for a while and he's always been a fan of the tiny format, in fact I just noticed this interview with Jim from Eectric Cowbell he's got up over there now. He's gone and started his own label to then partner up with six other record companies for this release. A-Side's "Macacoa" can only be described as precise. That salsa rhythm propels this one, the sheer inertia of the huge percussion section carries this with pin pointed horn burts. DJ Andujar mentioned these guys were metal heads playing prog-salsa and I can see how this is related to a mathy post punk in it's own array of working parts that have to come together perfectly like this cowbell clancking away in front of this. A weird organ solo consisting of the high end with a watery chorus kicked on at one point. 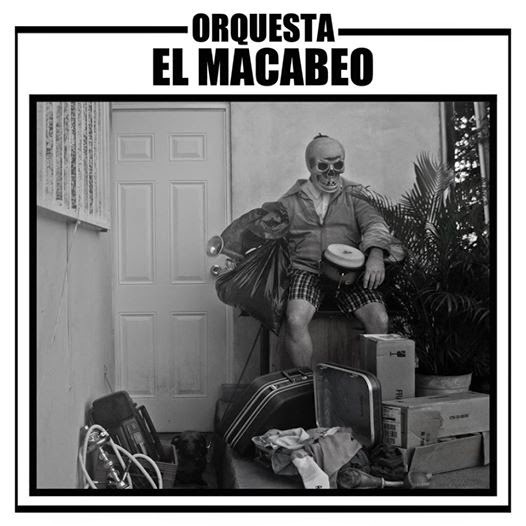 I like when my expectations get a little warped by contemporary elements or directions and Orquesta is tweaking things just enough before reeling it back in. I can't keep track of the number of constantly changing melodies piled up over each other and the chorus lyric against the lead has a nice normal depth to it, like it's a democratic space and the people are literally behind this. I never thought about this being as challenging as Dysrhythmia or Don Cab but when you start to pick out the pieces it's maybe even more impressive the number of people involved who have to be in perfect sync. As loose as this sounds, there isn't room for a misstep the rest of the guys are onto the next verse. B-Side's "No Se Cuando Llegue" has a deeper 'BROWP' from the horns working against a high brassy lens flare with less effect on the vocal on this side. Luis de la Rosa seems to be taking on the melody with a little vibrato in his high register, almost nasal delivery with that salsa rhythm working underneath this. The thing that gets me about this genre is the surgical use of horns, the way they're perfectly dropped in heart stopping jolts. There's a crazy frantic feeling inherent to this and I think if you were serious about drumming especially you would absolutely find yourself here eventually. There's a lot of work in these beats for a number of drummers, the core is concrete but you can work forever on those subtleties and the brass section has to be the most challenging part to get together regularly and work at this level. I have very little reference for this genre but it's easily as difficult as any of the post rock technical bands that are out there. Pick this up from Peace & Rhythm Records, send DJ Andujar a message over there on Facebook.